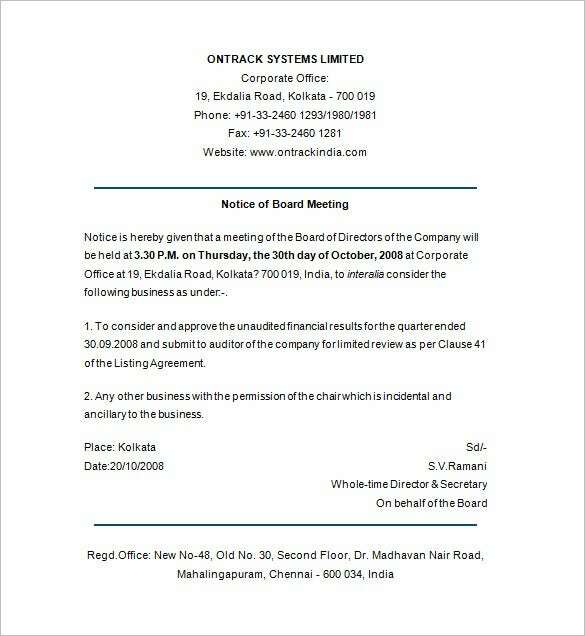 Notice example of meeting template is for corporate use only; it acts as an announcement for the shareholders about their important meeting for the company. 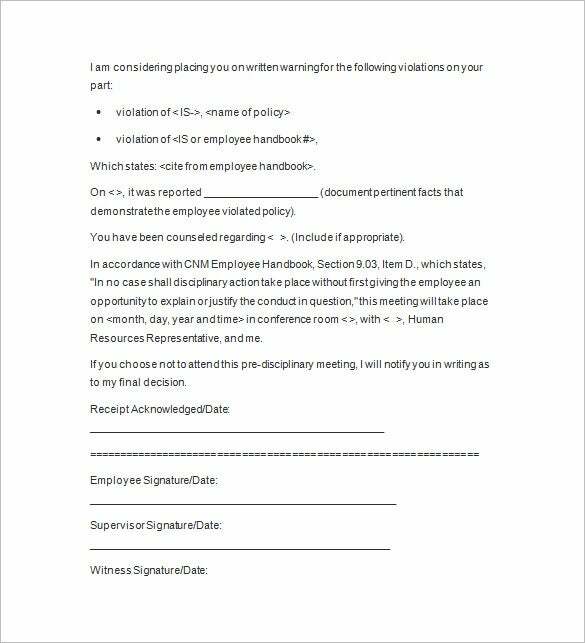 To make an appropriate notification of meeting, a coordinator can look at meeting minutes template to have a format and basis in making one. It must include the agenda and the date for the conference to make it pertinent for the receiver. 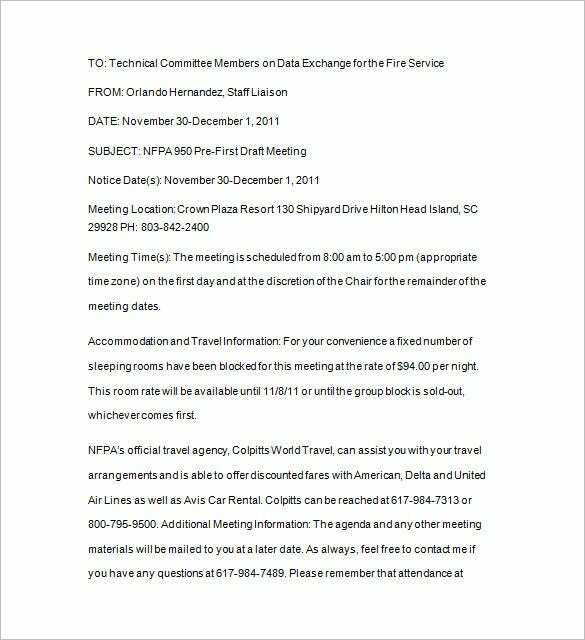 Notice of annual meeting word download template is a unique example of notice of the meeting templates. This one mentions basic information like time and date of event along with the purpose of meeting. Also, points of discussion in the meeting are included as well. It is available online for free downloads in PDF Format. 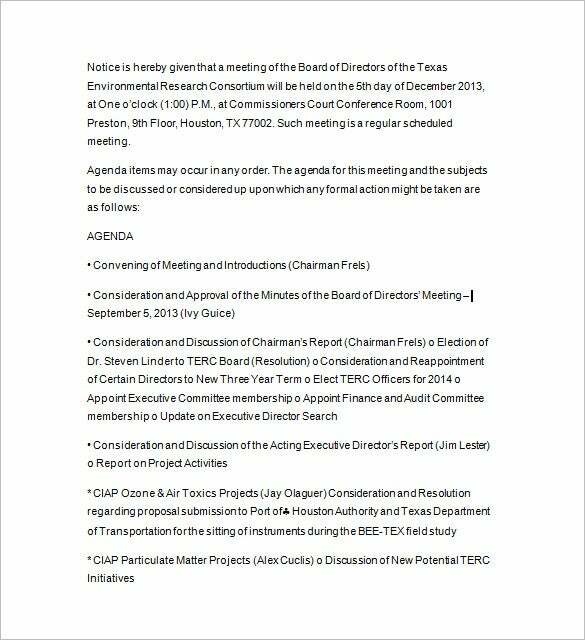 You may also see Meeting Announcement Templates. 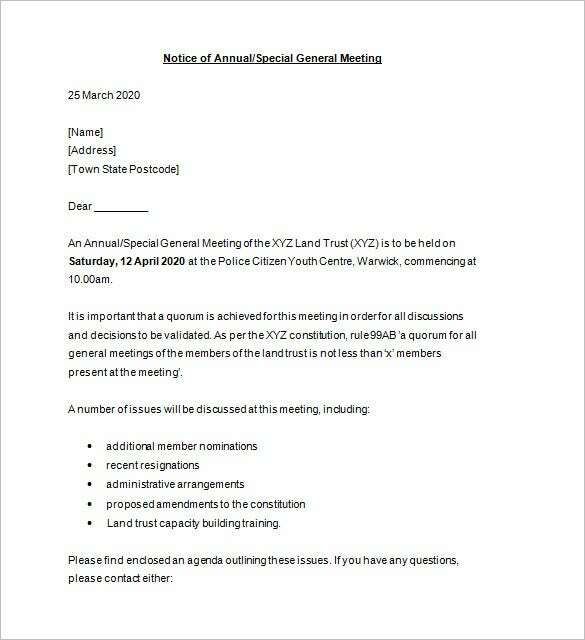 A general meeting notice letter excel format template is another interesting example of a notice. Information like meeting time, meeting accommodation and travel details, and other detailed information related to the meeting are also included in this detailed meeting notice. This unique document can be availed by users in Excel format. Also the document is complete free for downloads. Thus it is a great choice. 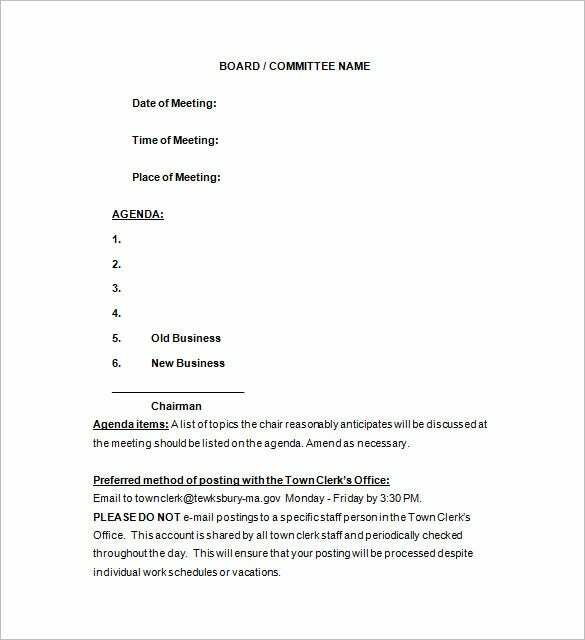 Board of directors meeting notice template is a template containing a notice specifically for a business’ board meeting. This is more of an Agenda document wherein apart from the basic details of the meeting, the points of discourse i.e. Agenda is also included. 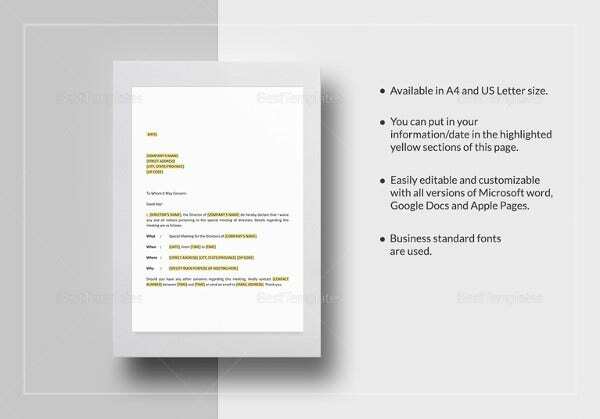 This sample which is available in PDF Format, this document is a wise choice if you are looking for a notice document that maintains professional tone. 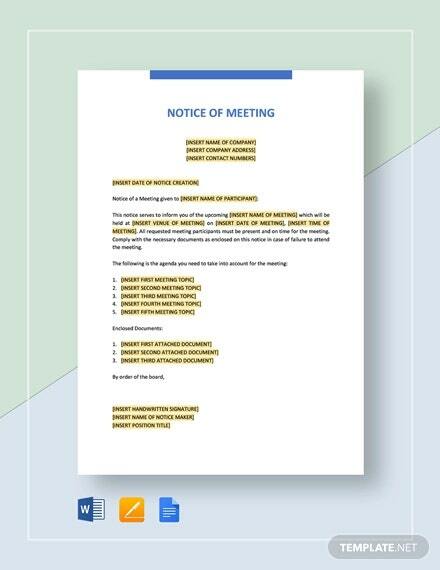 A special meeting notice free download template, as the name suggests, is a very impressive example of a notice document that is available easily for downloads and it is available for free use. Thus the users can have no issues in accessing it. The basic template of this template from other template is its format which is more spacious and in pointers. 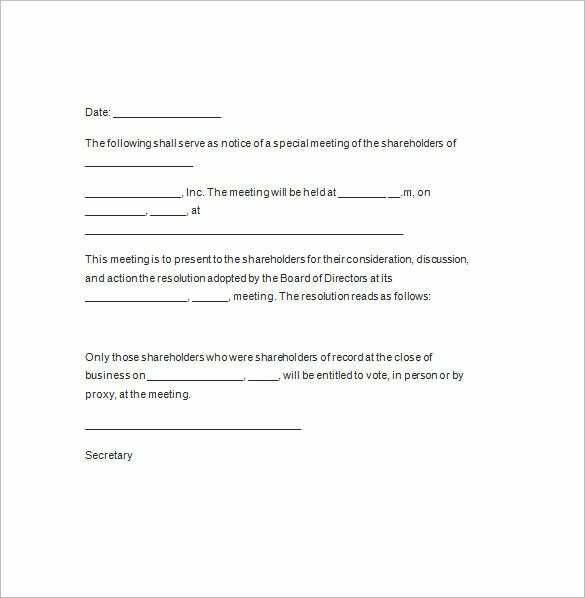 Other than that, this template is a wise utility friendly document which companies and firms can borrow for use during their special meetings. The template follows professional tone. It will make all shareholders to have their awareness for the conference, give their willingness to attend the meeting and prepare their plan for incoming assembly. It must be concise and direct to the agenda of the meeting for the shareholder. You can also see notice templates. 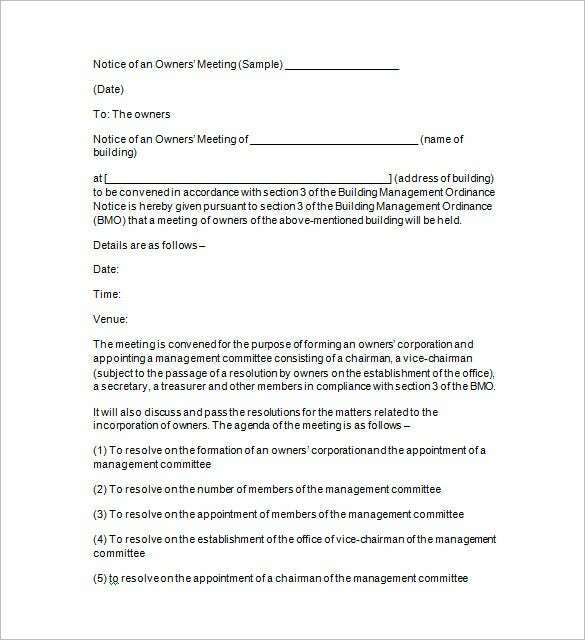 Why do we need a Notice of Meeting Template? Notice of meeting templates contain great quality notices. Notices are a medium of expressing a team meeting in a formal format. 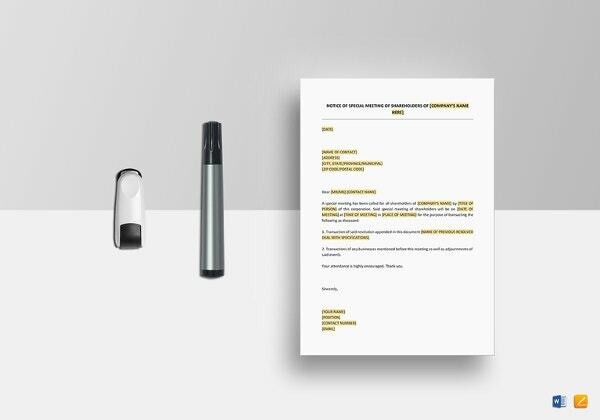 These are specifically used by businesses, firms as well as organisations which are organising a team meeting or meeting of directors can seek quality content of a notice from these templates. 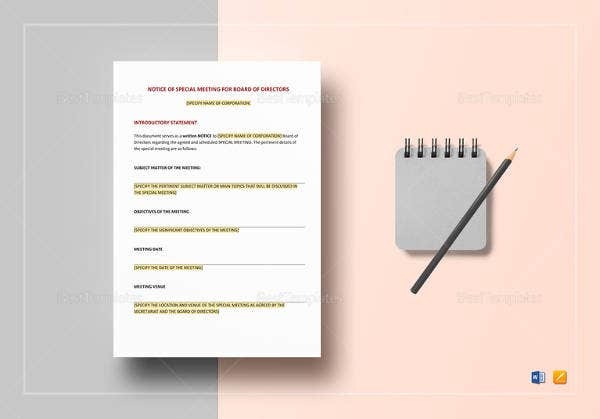 This portal contains a range of notice of meeting templates for the use of seekers who are in the process of creating a good notice of meeting. 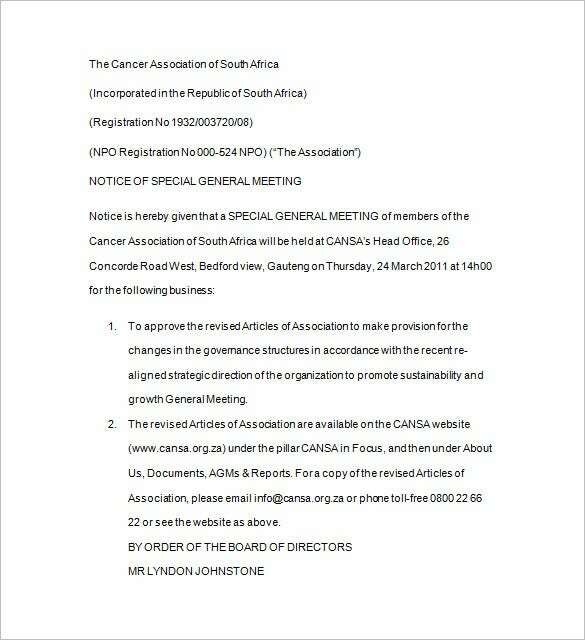 Thus these notice of meeting templates are needful for that purpose. You may also see Meeting Summary Templates. 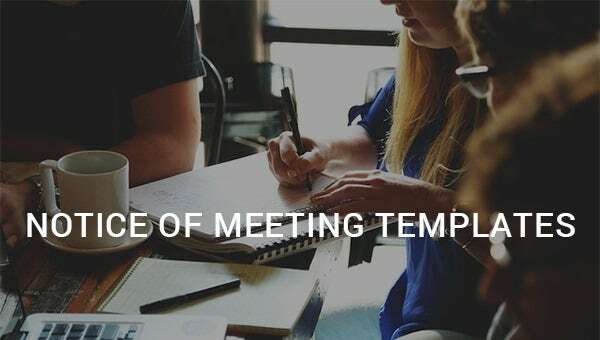 When do we Need a Notice of Meeting Template? This portal contains a wide range o notice meeting documents. Notices for all kinds of meetings both departmental meetings and collective meetings are included in this portal. This gives the user freedom and choice to choose appropriate document. 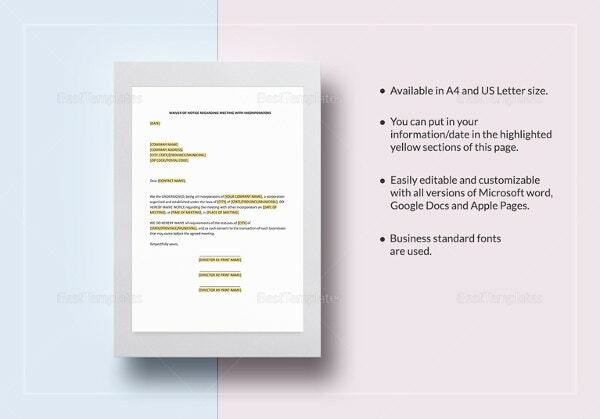 So if a user is in dire need of an amazing quality forma of notice of meeting document, he/she can refer to the templates mentioned here for an urgent use. Thus these templates are useful at that point. You may also check out Meeting Notice Samples. What are the Benefits of Notice of Meeting Templates? 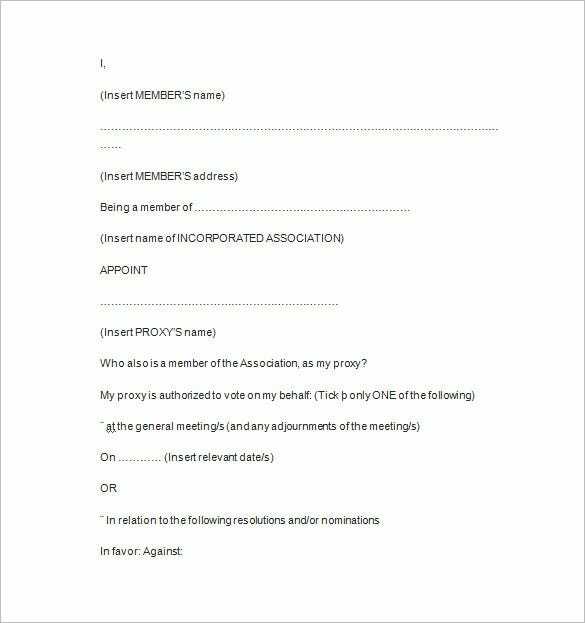 Notice of meeting templates are a unique collection of templates containing quality content. These templates assure quality since they are made by experts. 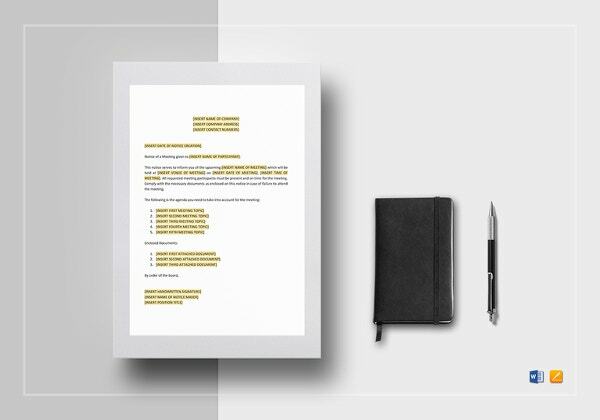 Experts design and formulate both the content as well as design of notice templates. So this is a very attractive feature for users and users also look for this feature in the templates. Thus it is primary. Also, these templates help one save time and money. All the templates available here can be downloaded by the user in various formats (like Word, PDF, Excel) for free use. That is the reason why users find these templates attractive. You may also see Free Meeting Minute Templates. A user can download free to access and easy to avail templates available in this portal. This freedom of choice helps the user. 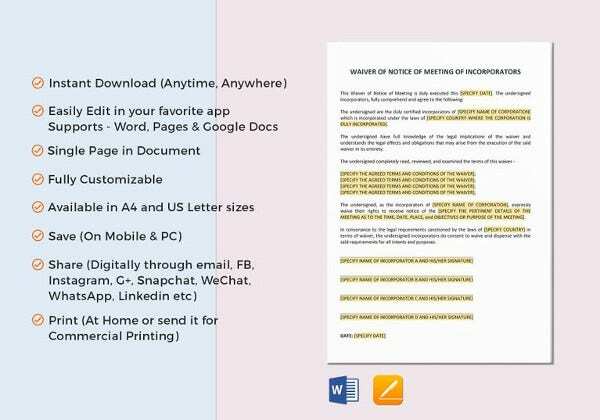 So for a good quality notice of meeting document users can use the documents available here. It can also be downloaded and edited for making changes ifoe needs to do that. Thus, the templates are a satisfactory choice.